If you haven't tried Kokoro Ramenya, you must! Located in Roxas Boulevard, across the US Embassy, this Japanese restaurant opened in April 2012 and has since drawn a lot of loyal customers for its outstanding food quality and taste. The facade of Kokoro Ramenya looks really fresh and inviting. It is at the 2nd floor of the Avenue of the Arts Building, where CBTL and Army Navy sits below the Japanese restaurant. You won't miss it. There are a few parking slots at the foot of the building as pictured, and there are also several other more slots across the building (a few steps away only). Upon entrance of the restaurant, we saw a few decorations as characterized by the usual Japanese interiors, which are always plain, clean, and refreshing. The colors of the tables and chairs are actually matched to Kokoro Ramenya's brand colors. In front of all the tables and chairs is the kitchen, where the customers can freely see through the cooking process via the half-frosted glass window. Kokoro Ramenya boasts of its in-house, freshly made noodles prepared by Japanese head chef and ramen connoisseur Susumo Murata. They not only serve ramen, but also a wide range of other Japanese food items as well. I went there with my friend Ria on a Monday holiday and was lucky to not be bumping to a crowded place. However, the waitress said they're usually full on normal days, as foreigners/guests/employees from the US Embassy and nearby office buildings would flock over their restaurant. Now, on with the food. My Japanese craving wouldn't be satisfied without my favorite Salmon Sashimi (Php295 for 8 pieces). I must say, it's oh-so-good! The salmon were nicely cut with the right thickness, and each piece really melts in the mouth as characterized by its freshness. Their salmon sashimi is the best I've ever tasted as of yet. Their Beef Teppanyaki (Php445) may be quite pricey, but definitely worth it. It comes with bean sprouts (which is my favorite vegetable) and corn on the side. We saw that the beef cubes were sizzling and the butter on top of it slowly melting away. Because it is very tender and flavorful, I highly recommend to pair it with rice (or you can simply eat it as is). Ria and I would normally order Gyoza (Php155 for 4 pieces) when we eat at ramen places. 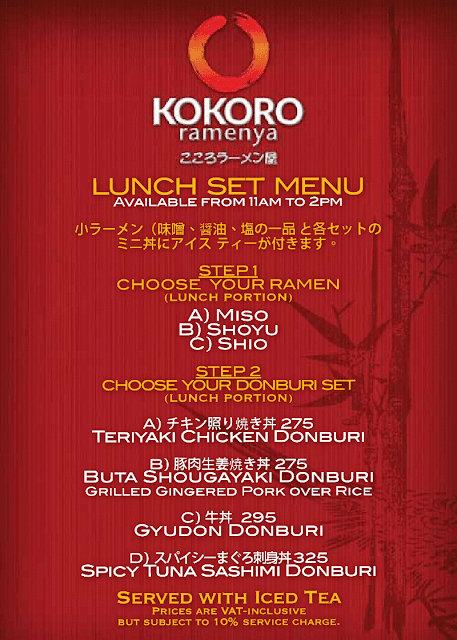 What I like about Kokoro Ramenya's version is the way they prepared and cooked it. As you can see in the picture above, it was burnt to perfection, so eating it gives a crispy texture. Also, I love that they didn't use too thick of a wrapper and the meat inside still remained intact and juicy even after taking a bite. On to the ramen, I ordered the house special Hakata Classic (Php325). It is characterized by its rich and creamy tonkotsu (pork bone) noodle soup boiled for 18 hours, with toppings of kikurage (mushroom/wood ear), chashu (pork), and eggs. I liked the blending of taste with its ingredients altogether, but it could use a bit more flavor and taste, since I like eating salty food. Ria's order of the Hakata Karaka (Php345) is the same with Hakata Classic, but spiked with hot spices. Mind you, it's very spicy. She loved how the egg was cooked with its sunny yolk being not too dry. By the time Ria finished her meal, she told me that she loved her bowl of creamy ramen. We capped off the sumptuous lunch with the Black Sesame Ice Cream (Php85 pictured left) and the Japanese Coffee Jelly (Php85 pictured right). The black sesame is just vanilla ice cream with brushes of black sesame, while the coffee jelly is vanilla ice cream sitting on top of coffee jelly chunks, mixed with condensed milk. Both are plain and simple, but can really be refreshing. Kokoro Ramenya's servings can actually be shared when in group. However, if you decide to visit solo or with a partner, you can try their lunch menu served from 11AM to 2PM daily, priced from Php275 to Php325. With it, you get lunch-sized ramen and rice meal, served with iced tea. I highly recommend Kokoro Ramenya, given the food that we've tried. We left the restaurant very happy and full. I am definitely looking forward to my next visit, so I can order the sashimi and teppanyaki again, plus also try the other ramen on their menu. For more information, visit their Facebook page or follow them on Twitter. 2nd floor, Avenue of the Arts Building, 1388 Roxas Boulevard corner Sta. Monica and LM Guerrero St., Ermita, Manila, Philippines.